On January 20, 2017, the 45th president of the United States will be inaugurated. He or she will take the reins of one of the largest and most complex organizations in the world, ready to move ahead with a set of priorities. In January 2017, the next administration will begin the hard work of implementing the President’s priorities. Regardless of the specific policies, implementation in many cases will require working across agency boundaries. By taking an “enterprise government” approach – starting in the transition and continuing into the White House – the next administration can deliver on their promises more effectively. In a new report, Jane Fountain lays out recommendations and a framework for how the new administration can build an enterprise government. Learn more about our Management Roadmap for the Next Administration, which includes highlights of our transition roundtables, blogs on transition topics, and reports that include recommendations and next steps. Read an article about this report in GovExec. Read the article in Federal Times about this report. Read an article about this report in FierceGovernmentIT. Listen to a Federal News Radio interview with Dan Chenok on this report. 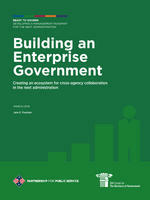 Read an article about this report in ExecutiveGov.